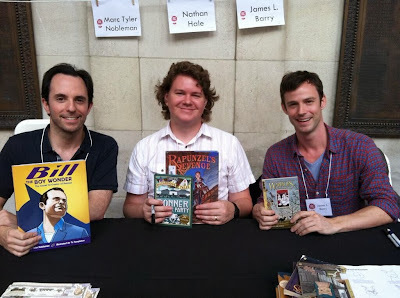 In 2009, I participated at my first Southern Festival of Books in Nashville, and was honored to be invited back this year. Some things remained the same. For example, now as then, I did not eat crickets. And now as then, I did a panel with talents I had not yet met but had an instant rapport with. This time with Nathan Hale (who had been recommended to me as a possible illustrator for Bill the Boy Wonder: The Secret Co-Creator of Batman) and James L. Barry. I was an author on an illustrator's panel so I had some justifying to do. For the second time in two weeks, I got to see the exceedingly nice Kevin Henkes. We signed side by side. Guess whose line was around the corner? The most rewarding moment for me was spotting two people reading Bill the Boy Wonder side by side. Every generation has its Batman. Thank you again to Lacey Cook and all others involved with running this massive show. Always a pleasure.